I may not be a comic book aficionado, but I'm trying! It's an art form I want to appreciate and understand much more than I do. It's like classical music. Over the years, I've asked friends to recommend comic books and classical music that they think will grow my appreciation, but I can never get much deeper than surface enjoyment. But I continue to try! And I love Free Comic Book Day. Free Comic Book Day is a single day - the first Saturday in May each year - when participating comic book shops across North America and around the world give away comic books absolutely FREE* to anyone who comes into their stores. It's brilliant marketing. It's so much fun. And it frustrates me so much that I've been out of town for the past several FCBDs, and unable to visit my local stores. This year, I'll be speaking a few hours south of my hometown, but I used the FCBD store locator to map the nearest places where I can grab those free goodies. So where will I be on May 5? I'll be in Ontario, CA for Teen Book Fest. And you should be there, too! It's at the Ontario City Library from 1-4pm. I'll be on a panel with Josephine Angelini, Anna Carey, and Alexandra Monir. If you stop by a comic book store before the event, let me know which comics you picked up, and I'll show you what I picked up. 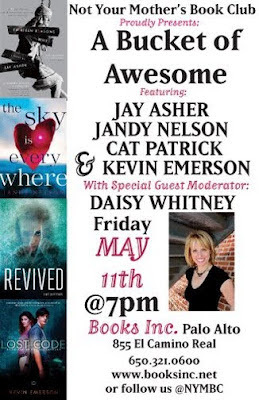 And next week, on May 11, I'll be at Books Inc. in Palo Alto, CA on another panel, this time with Kevin Emerson, Jandy Nelson, Cat Patrick, and Daisy Whitney. A few lucky people who come to that event will leave with CDs full of music each author chose to represent his or her latest book. My first trip to Canada since 1986 was exhaustingly exhilarating. I traveled the country from west to east (and then a bit west again) on a 3-city tour to help Penguin Canada launch their Razorbill imprint. The first stop was Burnaby, British Columbia. Due to flight delays and airport switcheroos, I had to hightail it straight from the airport to the bookstore. Thankfully, I had just enough time to down half a coffee before meeting Hiromi Goto and Carrie Mac for the first time and then joining them onstage. The next day, Lesley and I caught an early flight to speak at the L3 Writers' Conference. On the flight over, I decided to be a good passenger and review the safety card in the seatback pocket. 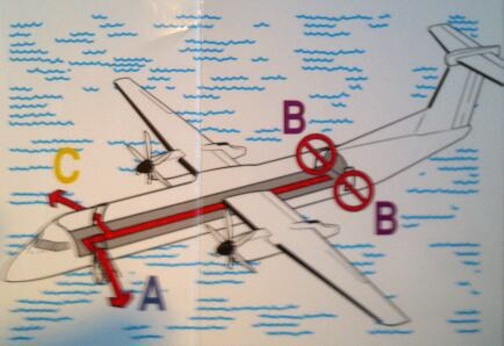 What was supposed to be an illustration of how to survive a water landing looked more like a Silly-Word Search. The Toronto skyline is beautiful, and I got to savor it during the entire ferry ride from the island airport, which took about 30 seconds. The conference was held at Barrie North Collegiate, where we were joined by Robert Paul Weston. We each spoke for about 20 minutes to the entire group (about 300 students from neighboring schools) before leading separate writing workshops. But the event kicked off with a funny yet sincere reading of a proclamation by the town cryer. That evening, Lesley and I were rejoined by Charles de Lint for a signing in Toronto, Ontario. Since it was the final stop on the Razorbill tour, we turned our cameras on the audience and asked them to hold up their books. Toronto has a great community of authors, and several of them showed up. The next morning, Lesley, Charles, and I spoke at two high schools. And while I love all the school visits I've done by myself over the years, I would easily agree to do more events with my two new author friends. Between the school visits, we had lunch with several people from Penguin Canada and Mable's Fables, the store which supplied books to the schools. Their store had a beautiful Razorbill display in the front window, which we checked out after lunch. When we saw the photo of us sitting in front of the display, we realized it looks like cover art for a band's album, so we named ourselves THE RAZORBILLION$. To read what some bloggers had to say about our bookstore visit to their town (including lots of great photos from their perspectives), check out this, this, and this. Next week, I'm doing my first book tour on foreign soil, traveling all the way to...Canada! I'll be on a 3-city tour with several Canadian authors, all of whom I can't wait to meet for the first time. This tour is to launch Razorbill's imprint in The Great White North. All events begin at 7pm. On May 5, I'll be in Ontario, CA for Teen Book Fest 2012 from 1-4pm. The event takes place at the Ontario City Library (not at the place I'd originally posted...which is why I came back and changed it!). I'll be there with authors Josephine Angelini, Anna Carey, Tahereh Mafi, and Alexandra Monir. Mark your calendars, bring your friends, and I'll see ya there! Recently, on Facebook and Twitter, I asked people to name their three favorite cartoon theme songs. Here are their top three selections, with the most selected song at the top. And below are my top three. 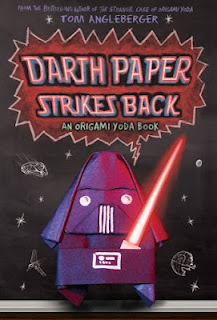 The Spring 2012 Children’s Books issue of Publishers Weekly is out! After the Snow by S.D. Crockett. What happens when a new Ice Age descends on Earth? Awkward by Marni Bates. Mackenzie avoids the spotlight until a disastrous day at school turns her into an Internet sensation. The Catastrophic History of You and Me by Jess Rothenberg. After literally dying of a broken heart, a teen watches her family members’ lives unravel. Chopsticks by Jessica Anthony and Rodrigo Corral tells a love story entirely through photos and drawings. Cracked by K.M. Walton. A teen lands in the psych ward with the bully who drove him to attempt suicide. Croak by Gina Damico. In this series launch, a teen discovers her family is in the grim reaping business. Don’t Breathe a Word by Holly Cupala. A girl accepts the help of a homeless boy in order to survive. Everything You Need to Survive the Apocalypse by Lucas Klauss. An atheist teen falls in love with a devout Christian. I Hunt Killers by Barry Lyga. A boy whose incarcerated father is a serial killer becomes a suspect when bodies start turning up again. Katana by Cole Gibsen. A teen can’t explain her dreams about 15th-century Japan or the samurai skills she suddenly possesses. The Lions of Little Rock by Kristin Levine. In this story of two friends in 1958 Little Rock, one of them is taken out of school, accused of being a black girl passing as white. The Miseducation of Cameron Post by Emily M. Danforth. A gay Montana teen is sent to a religious conversion camp to “fix” her sexuality. My Awesome/Awful Popularity Plan by Seth Rudetsky. Gay teenage Justin tries to become popular by dating a female classmate. The Not Quite Perfect Boyfriend by Lili Wilkinson. After Midge pretends that she met a cute boy over the summer, a boy who matches her exact description of him shows up at school. Odette’s Secrets by Maryann Macdonald. A Jewish girl leaves Nazi-occupied Paris to pose as a Christian in the countryside. Pilgrims Don’t Wear Pink by Stephanie Kate Strohm. The living history museum where Libby is interning turns out to be haunted. Radiant Days by Elizabeth Hand. A painter and a poet from different time periods enter each other’s worlds. Revived by Cat Patrick. Daisy, a test subject for a drug that can bring people back from the dead, realizes she’s part of an evil scheme. Run the Game by Jason Myers. Two teenage prostitutes fall in love. Shift by Em Bailey. Olive grows suspicious when a new girl who’s rumored to have killed her parents befriends the popular group. Sweet Evil by Wendy Higgins. Children of fallen angels are destined to promote such deadly sins as envy, greed, lust, and pride. This is Not a Test by Courtney Summers. Six teens are trapped inside their school during the zombie apocalypse. The Vindico by Wesley King. Villians plan to kidnap a group of teens to take over when they retire. What Boys Really Want by Pete Hautman. Adam decides to write a relationship advice book, infuriating his friend Lita. 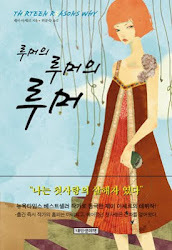 When You Were Mine by Rebecca Serle is a novel narrated by the girl Romeo was supposed to love. Now I'll tell you what prompted that email to Tom Angleberger where I so kindly handed him the idea behind his latest book. It was due to major frustrations we were having with the title of my soon-to-be-released book. When Carolyn Mackler and I were writing The Future of Us, we were calling it It's About Time, though we knew that would probably change. For months, our publisher had been tossing alternate titles our way, and we'd toss back other ideas. Sometimes they loved a title that we didn't love, or we'd love a title that they didn't love. And sometimes we'd love a title, send it to them, and then send a quick follow-up email saying, "We have no idea what we were thinking. That's a horrible title!" "Let's see, we could have a fortune bookie, or a fortune hookie, or a fortune lookie. Or, hey! 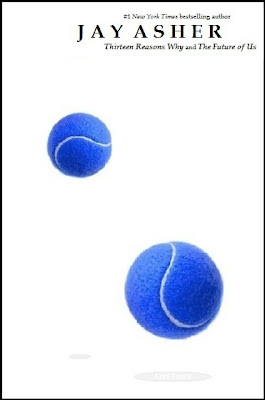 This is funny. We could have a fortune Wookiee. 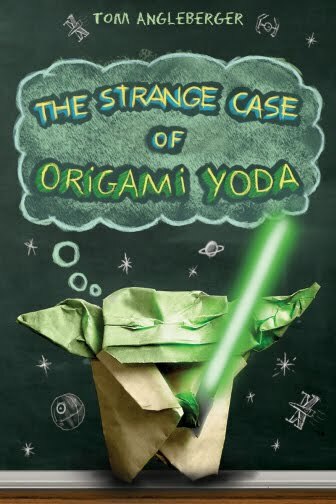 Hmm... That'd work better as an Origami Yoda book. Maybe I'll pass that along to Tom. 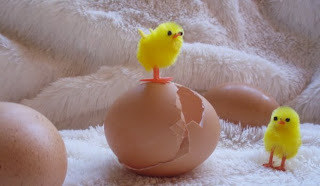 Okay, now where was I?" Yes, I kept that secret for almost a year! Want to see another cool part of this story? 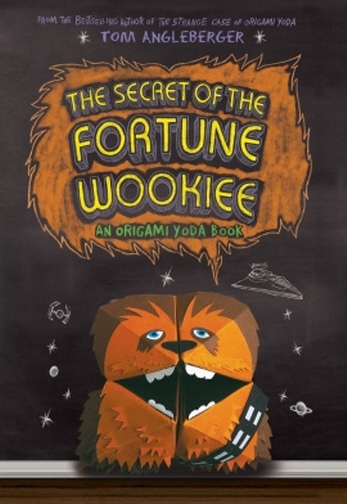 When I met Tom at ALA last summer, he gave me something that will maintain a very special place within my literary memorabilia: a prototype Fortune Wookiee! 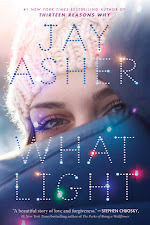 This October, my third YA novel comes out! 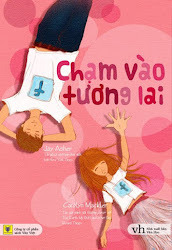 This book follows one boy's exciting, unpredictable, mystifying, and occasionally uncomfortable journey through the puberty years.